Pawòl Lakay, Fernand Léger • EDUCA • 2011 • ISBN 978-1-58432-687-8 • Includes 3 CDs • 54.95 $. Pawòl Lakay is a complete first and second year set of Kreyòl materials designed for beginners and intermediate learners at the college level. It is the most comprehensive resource for the teaching and learning of Kreyòl available on the market. This textbook adopts a pragmatic approach to the teaching of language; emphasizing the value of communicative competence, functional language use, and conversational effectiveness. Pawòl Lakay takes into consideration the most recent research findings, new theories and methods in foreign language teaching. It is designed in accordance with the Common European Framework of Reference for Languages and the ACTFL National Standards for Foreign Language Education. Pawòl Lakay meets the five “Cs” of the national standards for foreign languages which are: Communication, Cultures, Connections, Comparisons, and Communities. Pawòl Lakay provides students with the opportunity to learn more than the Kreyòl language. 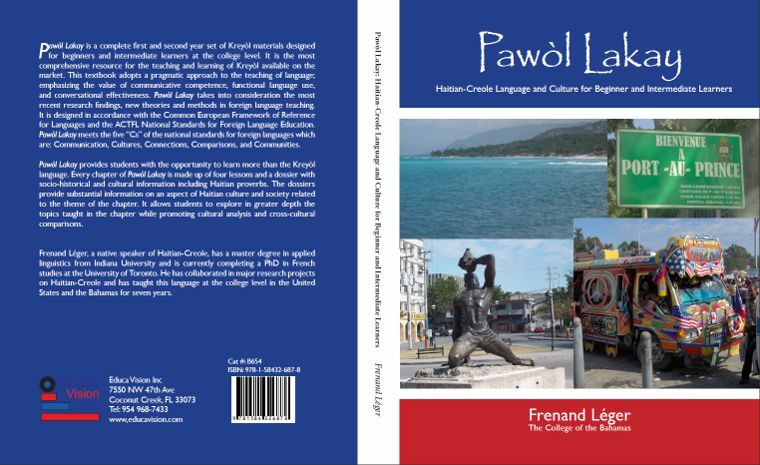 Every chapter of Pawòl Lakay is made up of four lessons and a dossier with socio-historical and cultural information including Haitian proverbs. The dossiers provide substantial information on an aspect of Haitian culture and society related to the theme of the chapter. It allows students to explore in greater depth the topics taught in the chapter while promoting cultural analysis and cross-cultural comparisons. Frenand Léger, a native speaker of Haitian-Creole, has a master degree in applied linguistics from Indiana University and is currently completing a PhD in French studies at the University of Toronto. He has collaborated in major research projects on Haitian-Creole and has taught this language at the college level in the United States and the Bahamas for seven years.